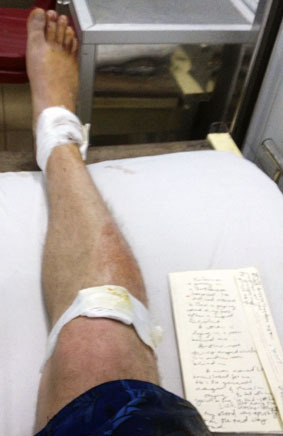 I recently returned from a small Island off the coast of Vietnam where I had a motorbike accident. I had hoped the serenity of the island would help me focus on writing, but the only writing I did was on the back of an envelope just after my accident. I’m lain on a gurney in a tiny Vietnamese hospital. I’ve just had stitches to close a gaping wound in my foot after a motorbike accident. A woman is dying noisily in the room behind me. Another, even more serious accident is in the cubicle beside me. A man name ‘Luck’ translated for me. He’s the general manager of where I’m staying. He sat with me, “you’ll be fine”, he said – but he left during the stitches, looking queasy. Luck! A one armed, few toothed man just wandered into the hospital, selling lottery tickets. My blood was spurting out on the red clay road. I tumbled and slid on my right hand side. My Frankenstein monster foot, in stitches. I was a boy the last time I had stitches. Foot feels weird, taut, numb. Oh, the people I love. I love them. A man staunched my wound with a ripped open cigarette, the nicotine leaves sopping up my blood and stinging into my system. “What can I do?” I asked myself on that red clay road. I love you. If ever I have loved you. I love you.